I very rarely cry at books. I'll get sad, my heart will hurt, my eyes might tear up, but it takes a lot for those tears to actually spill over. 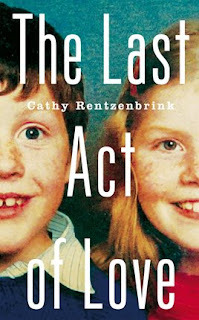 So when I tell you that when I finished the last page of Cathy Rentzenbrink's The Last Act of Love to realise I had tears running down my face, it should clue you in to how powerful a memoir this is. I should say at this juncture that I work with Cathy - I know her professionally, and consider her both a mentor and a friend. Beyond knowing the subject matter of the book, I didn't really know what to expect from The Last Act of Love. What I found was an intensely personal tale dealing with the universal subjects of love, family, and loss. In the summer of 1990, Cathy's younger brother Matty was knocked down by a car, leaving him in a coma in hospital. Cathy and her parents willed him to survive, and he did. But at the time, Cathy and her family had no idea that survival might not have been the best option - Matty was left severely injured, unable to walk or speak or communicate fully. Every time he made progress, he suffered an epileptic fit, or something else that set him back. Eight years after his accident, Cathy and her parents were forced to make the hardest decision they would ever make. The Last Act of Love is almost unbearably sad, as Cathy recounts the way her brother, a lively, funny, clever, loving teenager, was robbed of his life. Matty went from having everything in his grasp, to not being able to hold his own body upright. It is partially a story about suffering - Matty's, Cathy's, their parents'. And it's a story about sacrifice too, about the things that Matty's family gave up to look after him, and about the feelings and desires they put aside because of the deep abiding love they felt, and still feel, for Matty. Undoubtedly, some of the most painful parts of The Last Act of Love are when Cathy and her parents come to the realisation that prolonging Matty's life may not be the best thing for him. Cathy's mum's affidavit to the court, asking them to let Matty die, is blisteringly honest. It also gives the book its name - letting Matty go is his family's last act of love for him. But while The Last Act of Love is sad, it's also a book about courage and hope, about pushing through and living life. It's about love, and how love never goes away, even when a person is physically not around. It's about how it's okay to carry on loving, to keep the memory of someone with you long after they've gone, and about how it's okay to have been changed by the loss of someone, and to miss them years later, and to never stop missing them. It's about how it's ok to hold someone in your heart, and always keep them with you whatever you're doing. I have never been through anything like what Cathy and her parents went through, but I do know what familial love feels like. Cathy writes with such honesty that I believe her story speaks to all of us, to anyone with a heart and to anyone who has ever felt love, and that's why it left me in tears. *The Last Act of Love is released in the UK by Picador on July 2 2015.